Many a times, we need to visualize and summarize the existing information of the biological sequences like protein or DNA. For this purpose, a new software package has been introduced called ILLUSTRATOR Of BIOLOGICAL SEQUENCE (IBS) which is used for representing the organization of protein or nucleotide sequences in an easy, efficient and precise manner. It visualizes various functional elements. Different features have been provided in IBS such as diagramming of domains,motifs, rescaling, coloring and many more. The standalone packages of IBS were implemented in JAVA, and supported three major Operating Systems, including Windows, Linux and Mac OS. 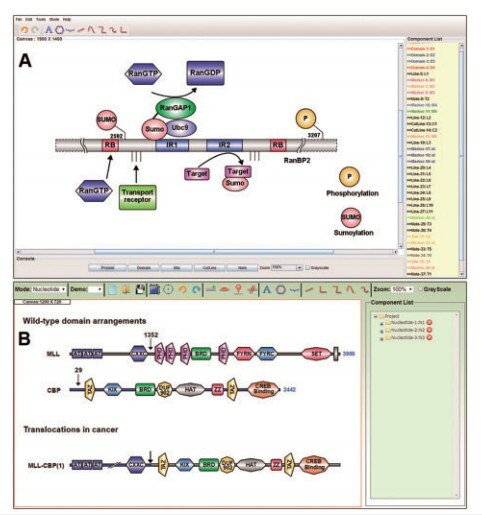 the annotations of both protein and nucleotide sequences is supported by the implementation of various drawing elements. an ‘export module’ is generated with the help of which the final generated artwork can be exported to any publication-quality figure. various built-in textures enables to color the black-and-white diagrams as per the requirements. easy retrieval of UniProt annotations. IBS provides individual modes for both proteins and DNA, the protein or DNA sequences can be represented in individual modes. IBS may be proved as a very useful software in many biological researches, for example, with the help of IBS, one can easily diagram the translocations that occur in cancer by parallel view of the wild type arrangements existing in the sequence (as shown in Fig. 1).